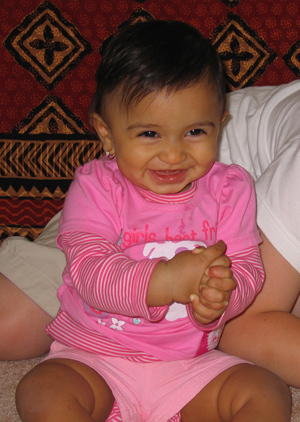 Kali Soleil Athukorala was born on August 25th, 2007 at 1:13 PM in Northampton, Massachusetts, USA. Her mother, Sandra Clarissa Zemialkowski, deceptively removed Kali from her home on December 21st, 2007. 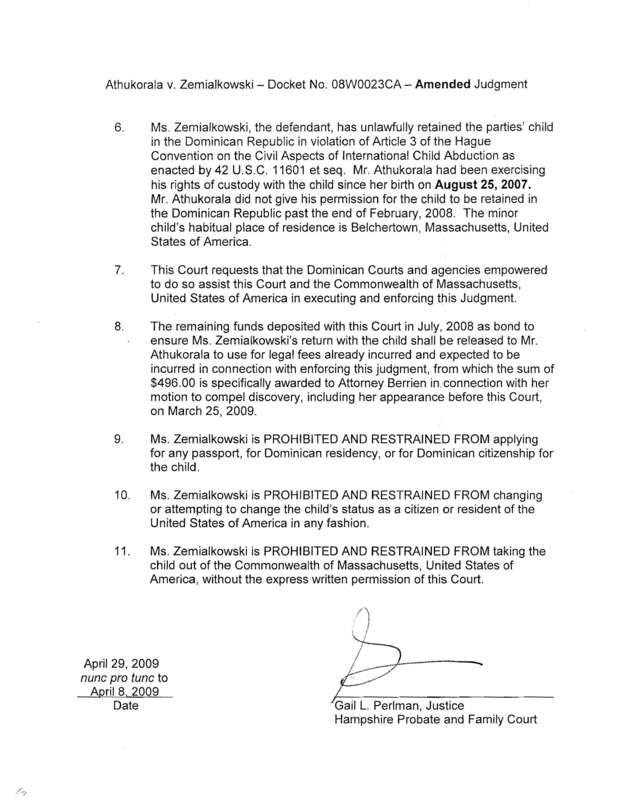 Sandra deceived Kali's father into signing a letter of consent to travel outside the United States on the promise that Kali would be returned to her home in Massachusetts on January 11th, 2008. In April 2009 Sandra Clarissa Zemialkowski was divested of her rights of custody to Kali Soleil Athukorala after a year long custody trial. Custody of Kali was awarded to Kali's father. 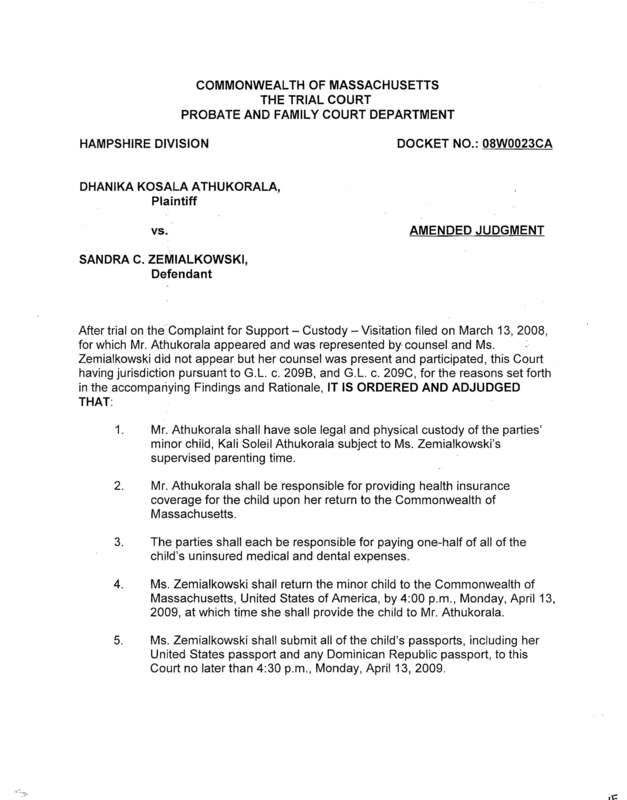 Sandra Clarissa Zemialkowski failed to return Kali to her home and her father, on April 13th, 2009, as ordered by the Court in the final judgment. Kali was last known to be unlawfully and wrongfully retained in the home of her maternal grandparents, Walter and Clara Violeta Zemialkowski, in the city of Santo Domingo, Dominican Republic. Kali is a victim of Parental Child Abduction. My name is Dhanika Athukorala, Kali's father. Kali lived with me in our home for the first 4 months of her life until she was deceptively removed from her home by her mother Sandra Clarissa Zemialkowski for what was claimed to be a family vacation. I am the sole custodial parent of Kali Soleil Athukorala as determined by the Hampshire County Family and Probate court in Northampton, Massachusetts which has sole jurisdiction to determine matters relating to Kali's custody and care. Ever since Sandra's deceptive removal of Kali, it has been a struggle for me to maintain my relationship with Kali; Sandra has impeded and obstructed our relationship at every opportunity; Denying me the right to have my daughter for overnights until ordered to do so by the courts, interfering with my access to Kali and going so far as to manufacture false allegations against me and attempting to bribe a witness to support those allegations during a scheduled visit with Kali in the Dominican Republic. Kali has had no contact with me since the beginning of April, 2009, due to the actions of her mother. Kali Soleil is too young to know what is happening to her. She cannot know that her relationship with her father is being thwarted and interfered with by the deceitful actions of Sandra Zemialkowski. It is all the more tragic that Sandra Zemialkowski happens to be Kali Soleil's mother. Someone who most likely Kali believes she can trust and yet has, unknown to Kali, betrayed that trust in a most tragic and deceitful manner. As her father, this has been the most emotionally traumatic experience of my life. I have so eagerly anticipated being a father to Kali Soleil only to see her abducted after 4 months. A part of me is dying without her in my life. As much pain as I am going through it is Kali who is the true victim in this tragedy. Kali Soleil is being denied her right to be with her father and know the love and care of her father. When she grows up and can understand what her mother has done it is going to be very difficult for her to come to grips with this tragedy. Sandra has failed Kali Soleil during one of Kali's most vulnerable stages of her life. Parental child abduction is regarded as a form of child abuse for good reason. Though I will never know for sure if I will see her again I can only hope that each agonizing day that passes brings me one day closer to my re-unification with her; the love of my life, my daughter Kali Soleil Athukorala. A switch was turned on inside me when Kali was born that can never be turned off; the switch that is a parent's love for his child. A bond exists between us that can never be denied nor broken by the deceitful actions of her mother. I can never give up on her and have to keep on with the struggle for her return. "Abducted children suffer emotionally and sometimes physically at the hands of abductor-parents. Many children are told the other parent is dead or no longer loves them. Uprooted from family and friends, abducted children often are given new names by their abductor-parents and instructed not to reveal their real names or where they lived before."